Nursing scholarship program, which provides an incentive for students to become nurses. The Tuition Incentive Program/high school completion awards program is designed to give students from low-income backgrounds incentive to graduate from high school and then college. 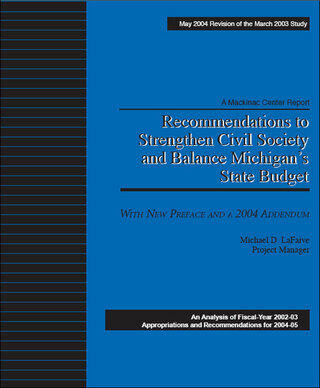 Eliminating the above grants would produce a savings of $260 million based on Governor Granholm’s 2004 budget. These programs take money from students and parents through taxes, pass it through the administrative bureaucracies of the many grant programs, and return it to students — minus the costs of collection and administrative overhead. State subsidies also drive up the costs of higher education. The state of Michigan should adopt a policy that encourages students to rely on their families, themselves, private foundations and scholarships, and private business grants and loans to fund their education. Ideally, students should be independent of the state for financing their educational needs, just as they should be for their food, clothing and shelter. The Mackinac Center has expressed this idea in a recent article about the tuition grant program, a program that helps subsidize students at private college and university education. It follows. Gov. Granholm wants to end $64.8 million in direct annual subsidies to Michigan private college and university students. The move will eliminate just a fraction of the state’s projected $1.3 billion deficit, but it illustrates precisely the type of restraint necessary to correct years of state overspending and opens an opportunity to improve the way higher education is funded. The Tuition Grant program is a 37-year-old fixture of the state budget. The program’s $2,000 annual grants are very popular among the low-income students who get them and the 39 private, nonprofit colleges and universities where the money is spent. Those who favor extending these subsidies point to the college students who benefit from each of the more than 40,000 checks. But there are always benefits on at least one side of any transfer of wealth. The cost side of the ledger must also be considered. Not only must somebody pay every penny of Michigan’s $39.7 billion budget that is received by someone else, every dollar spent on one state program must be weighed against the value of spending it on another program. Not all state priorities are created equal. State officials have already eliminated some non-core spending, including funding for such items as "equestrian princess pageants," "Horse of the Year" balls, and free fruit and vegetable distributions at a highway rest stop. They closed last year’s spending gap without resorting to broad-based tax increases. But more cuts are needed to avoid a disastrous repeat of the 38 percent income tax hike imposed the last time a Democratic Michigan governor faced large deficits. Defenders of private tuition subsidies should expand their arguments beyond the undisputed fact that some students benefit from them. They should recommend precisely what other state spending should be cut in order to preserve their Tuition Grant program. The cuts can be made; the Mackinac Center for Public Policy has recommended more than $2 billion in lower spending and sales of unneeded state assets. In some cases, just a rule change would produce mammoth savings. Repeal of the state’s prevailing wage law for school construction alone, as Ohio has done, would stop the annual waste of more than $150 million. Even if money were no object, private-college tuition subsidies for poor students may not be a proper function of the state. The hallmark of civil society is the voluntary, mutual benefit derived by both parties to a transaction. Yet, no matter how much or how little benefit is gained by the grant recipients, the state makes no effort to determine how much benefit is forgone by individual taxpayers who would have spent the $65 million on voluntary priorities no less worthy than the private-college students they are forced to support. Such subsidies can be culturally, as well as economically, divisive. Although the program restricts some courses of study, several of the qualifying schools are religiously affiliated or explicitly sectarian. Should either atheists or devout Catholics be required to directly subsidize tuition at thoroughly Protestant Grace Bible College? If the state were not already overspending, and if private college tuition subsidies were a proper function of the state, there would still remain the question, "Is our Tuition Grant program effective?" Two features of the program suggest it is more costly than necessary. The tuition grants do not have to be repaid. There are income requirements (lower incomes qualify), but there is no requirement for students to first tap into available student loans, nor even to seek summer employment, before receiving the full grant. This means that middle-class college students who don’t qualify for the grants are taking out student loans and working summer jobs to pay for school, while their parents pay taxes to support low-income, nonworking private-college students who can graduate debt-free. This is unfair, and it raises the program’s cost by encouraging students to go after the "free" money first. In 2000, private colleges and universities provided nearly $8 billion in private assistance to students who needed help with tuition. Students of all income ranges can still receive heavily subsidized schooling at well-regarded state universities. Michigan’s current overspending problem, coupled with questions about the fairness and effectiveness of the Tuition Grant program, make private-school tuition subsidies a good candidate for elimination. Savings: $261,695,400. Governor Granholm’s 2005 proposal decreases the gross appropriation to $134,991,300. Author’s Note: Much of the decrease in the proposed budget is a result Governor Granholm’s recommendation that the state end the "Tuition Grants" program, which will save about $64.7 million.